Lomalinda is a beautiful place. It’s located in the plains of eastern Colombia, however Lomalinda isn’t flat. Lomalinda translates to “Beautiful Hill” an apt name for this land. The rolling hills are a peaceful contrast from the stubbornly flat land it lies between. Sadly, Lomalinda has not seen peace for the last few decades. 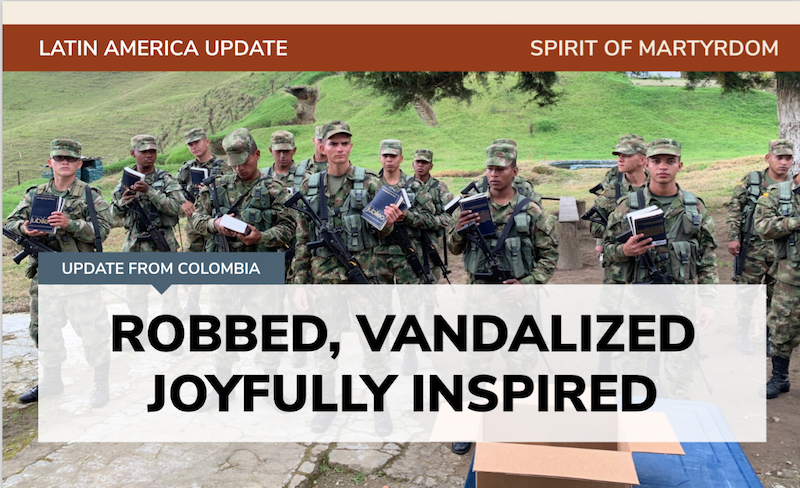 It has been smack in the middle of the war that has assailed Colombia for the better part of 50 years. In the late 60’s and early 70’s, Wycliffe Bible Translators found this hidden paradise. They were enticed by the large lake, which they thought would be a good seaplane base for their airplanes. This lake brought with it a varying amount of wildlife. Among others: deadly snakes, capibaras, howler monkeys, otters, all kinds of birds, armadillos, sloths, anteaters, poisonous ants, piranhas, freshwater stingrays, and the great anaconda. Wycliffe settled there with my grandparents and father and started translating the Word of God into all the different indigenous languages in Colombia. Wycliffe and other ministries left this land in the 80’s and early 90’s because the war got so heated. It was abandoned for many years and the once beautiful brick buildings were now just ruins leveled by the madness of war. My dad purchased some houses that were still standing and fixed them up in the late 90’s. 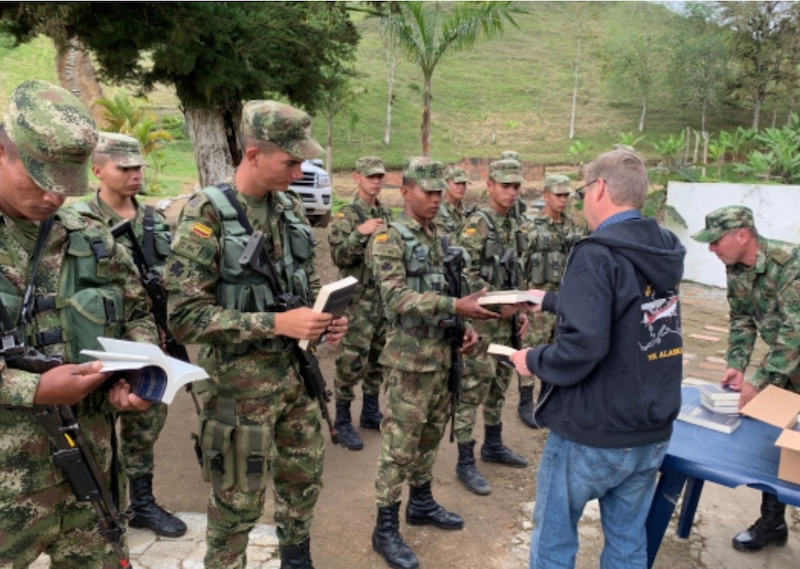 The Lord inspired him to turn this once linguistic and Bible translating facility into a center where the Word of God would be broadcast to all sides of the war. Not only were we broadcasting to the people in the war, but also we were in the midst of it. Lomalinda was our second home. We spent the same amount of time in Lomalinda as in our apartment in Bogota, maybe even more. Almost every month we had new neighbors, either military, AUC paramilitary or FARC communists depending on who had won the battles close by. We found favor in each group. I even played soccer with most of them. Volunteers helped us build the transmitter and powerplant sheds. 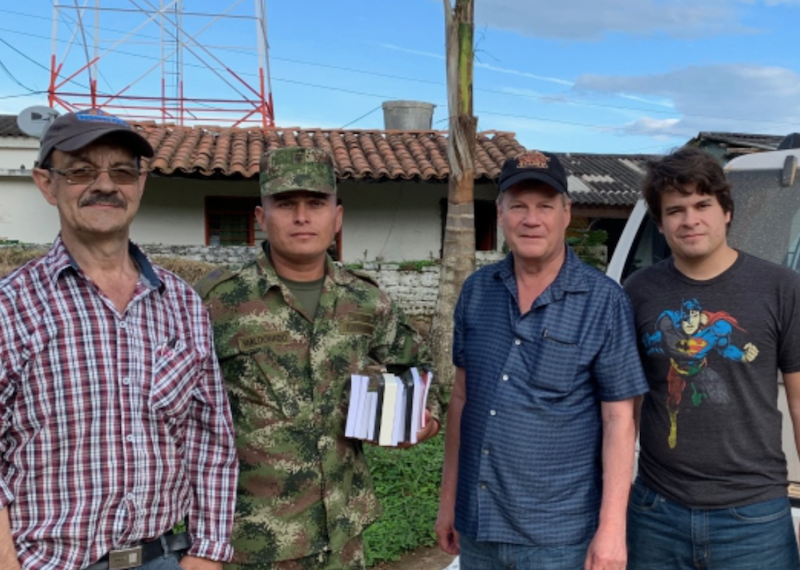 Top broadcasting engineers from around the globe set up a very powerful antenna for our shortwave stations that could reach far off places around the world. Disney donated one of the most powerful AM transmitters in the world and sent it to us in Colombia. I had never seen anything like it! These powerful behemoths could send out a signal of 50,000 watts and it could be amplified even more by the incredible antenna designs our top engineers invented. Our FM broadcasting tower was the 3rd highest in the country. The FM stations goal was to help the community because it was the only form of communication around. Rural families would send messages to their family members in distant towns or farms. Families would send messages to their wayward sons and daughters in the FARC, and AUC paramilitary. It was even used to send messages to family members who were kidnaped by those terrorist groups. Interesting characters would call in the middle of the night to request songs and ask questions about the Christian messages, among these were some high-ranking commanders of each armed group. Some of the questions about the messages were so deep our Deejays knew that God was moving in their hearts. One commander would call at the same time, around 2:00 a.m. and request a song along the lines of, “I’m always in trouble, that’s just who I am” and my dad decided to re-record that song and it went like this: “I was always in trouble, but Jesus changed my ways.” This new song turned into the commander’s favorite. Schools would send field trips to learn about the different radio stations, the AM, FM, and Short-Wave frequencies, leaving Lomalinda with some of our literature and hopefully a Bible and a solar powered radio, if we had any. People who had disbanded from their armed group would come and visit to see the station that had led them out of those illicit groups into the ways of peace and righteousness. People who had been kidnapped visited us and thanked us deeply because we were the only news from home that they would get deep in the jungle. Many of them confessed that it was those stations that gave them the hope that God was still with them and He would never leave them. From there the first airplane, loaded with parachutes tied to Bibles and Galcom radios took off and dropped the Word of God on an area that hadn’t seen a Bible in ages. Imagine the Word of God falling from the sky like manna in the desert. What the Lord did there was beautiful. However, suddenly as we started all this in Lomalinda our family was not welcome in the area anymore. My dad and our family received continuous death-threats. Even the people who dared to read our literature received death threats. We left that area with the radio stations still working and with staff members still in charge. Our constant visits became once in a blue moon event. My sister couldn’t even go back to care for her horses. The Lord did not let us go back. More than the threats and the insecurity we felt in Lomalinda, it was the Lord who didn’t want us to go there for a while. He was working on something new. The Lord redirected us to Cauca, an area on the other side of Colombia. We met Marco Tulio, a Nasa-Paez Indian who is the leader of a Christian displaced community. With international help, the Lord gave them land in Cauca and in a year, they were self-sustainable. We came in contact with Guambiano Indians who had the first Christian evangelical church in Colombia. Whole areas of Colombia that were thought to be the most dangerous were now crawling with Christian Indians. We put radio stations in many of these areas. Amazingly, these Christians had the Bible in their language, which in itself was incredible. All these Christians had to of come from somewhere; the Lord had sent missionaries to them long ago. And some of those missionaries came from what once was the linguistic Bible translating center of Wycliffe, Lomalinda. Some of them were even sent by my grandfather. Imagine that! To our dismay, the radio stations in Lomalinda were robbed and vandalized at the end of 2018. Copper wire worth thousands of dollars were hacked and stolen. A priceless amount of damage was done to the state-of-the-art transmitters. We think it’s a group of people that want us to completely abandon the area. Not even our personnel are safe there anymore. It has been a hard few months trying to understand what the Lord is doing with all of this. Did He want us to abandon all of that into the hands of thieves and robbers? Did He want us to go fight for our land? We know that if the Lord doesn’t fight for us, whatever we fight for in our strength is in vain. It has been a very disheartening situation. My dad has always told us the Lord is the same yesterday, today, and forever and that He always likes to make new things. The Lord has been abruptly changing our focus in Lomalinda and I’m sure He wants it to grow, but with growth comes growing pains. Growing pains not only for us, but also for the staff we had working there. God is taking us in a whole new direction. We told our troubles to our Christian Indian brothers in Cauca and the Lord showed them to help us. When Marco Tulio (the Indian leader) found out that our radio stations were in Lomalinda, he could not contain his joy. When he was just a child he remembers two missionaries who came from Lomalinda to translate the Bible he now uses in his community church. He told us, “We will help! That is where the gospel was sent for us. We have to help.” Now the Indians from the opposite side of Colombia are sending missionaries to Lomalinda! They want to maintain and protect what is left of our radio stations. More importantly, they feel inspired to make Lomalinda a center of formation for Christian indigenous people of all tribes. A place to teach people of God, manual trades and refuge where persecuted Christian Indians can go and get the tools to impact other communities. It is more than we could have ever achieved on our own. But if this is really God moving, then there is no stopping it. My dad, mom and I were in Lomalinda recently helping our staff pack their things. A hard and heartbreaking situation in itself, but we were also welcoming some of the first Nasa-Paez missionaries to the land of Lomalinda. During the evening, I was walking outside and I felt there were some eyes looking at me. I turned and I saw the silhouette of a person near the gate of my uncle’s house. I called out and said, “Hello…!” But there was no response. I said, “Are you looking for my uncle?” He said, “Javier is your uncle?” I said, “He is.” I asked what his name and how old he was and he said, “Santiago, I’m 9”. I told him that my name was “Martin” (what people call me and my dad in Spanish). He quickly ran under the gate and hugged me saying “MARTIN! MARTIN!” I was so surprised, but I knew he thought I was my dad. I told him that I wasn’t “the” Martin, that I was his son. It didn’t seem to matter because he kept me in his embrace. But I told him the “real” Martin was inside. He was so excited. He said “INSIDE? !” I brought him in to see my dad. As soon as he saw him he ran so excited shouting “MARTIN! MARTIN! MARTIN!” He hugged my dad. We sat him down and gave him a glass of Coca-Cola and asked him why was he out here at night and where were his parents? Or who was supposed to be with him? He said that he ran away from his halfway home. His parents were dead because of the war and that the local orphanage and halfway house had taken him in because his sister was too young to care for him. He said he didn’t like the people in charge of the halfway home or the orphanage and he was a rebel so he would escape and go to my uncle’s house for a place to stay. He disliked all of the people in charge except one lady that every night she would put my dad’s messages through a speaker. That’s how he knew my dad. He loved the messages and loved the lady who played them for him. We were so moved by his story to say the least. It is amazing how even this nine-year old could understand the messages. It has inspired me to not lose hope in this area of Colombia. It inspired me to let the Lord turn me into something new day by day so that we can continue to have an impact on people. Even if it’s a nine-year-old orphan who calls himself a rebel.